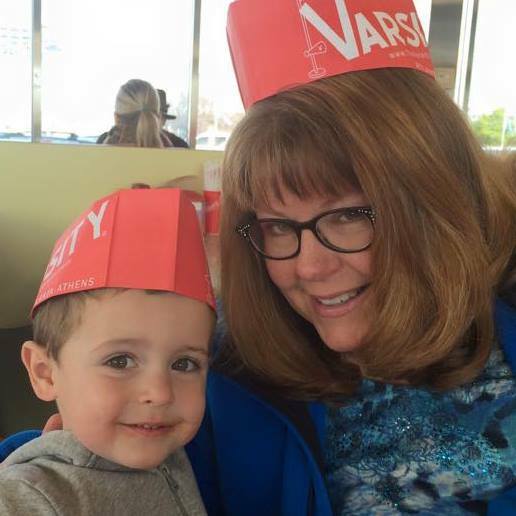 Today we’d like to introduce you to Karen Burnette Garner. Karen Burnette, please kick things off for us by telling us about yourself and your journey so far. In my twenties, I was a stay at home mom, with two little ones, when my father died suddenly. During that time of grief, my mother suggested I take a few classes at the local parks and recreation center. It changed my life. I met my mentor, John Baden-Nuttall, there, and for three years he taught me all he knew about art, the business of it, the creating of it, and the “seeing” of it. It formed the basis for a life of creating art, growing in my knowledge by constantly researching how art is created, how art is marketed, what leads a person to want to possess art. I studied with the late Al Brouillette, whose influence is still evident in how I use negative space in a painting. 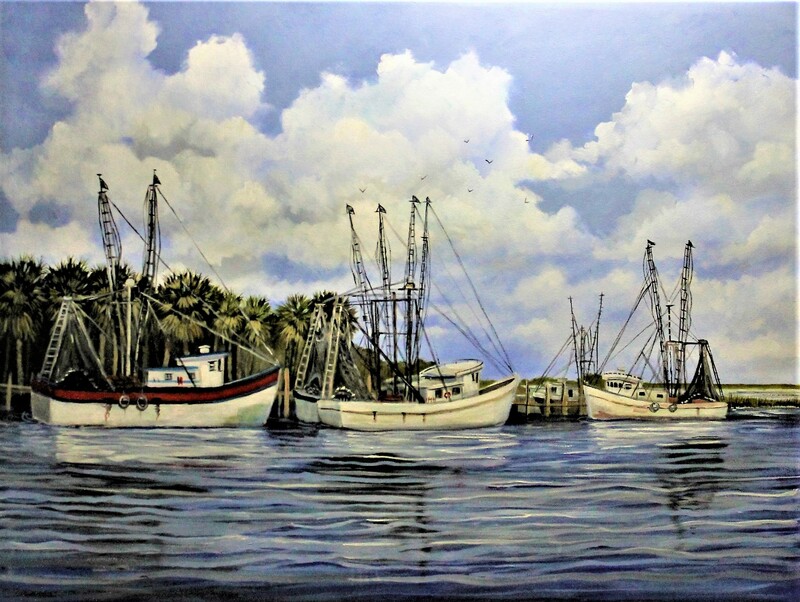 I modeled my marketing on the career of Ray Ellis, a generous man, and talented painter, and I began a series in 2003 of low country art from the inspiration of Southern writer Pat Conroy. 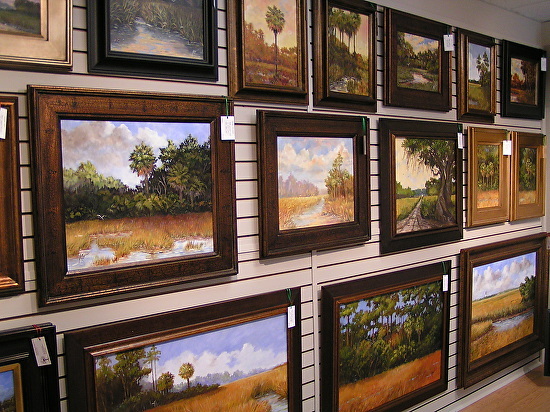 After creating over 2000 artworks, 1500 are low country marsh scenes that now reside in homes and businesses in Charleston, SC. I’ve done solo shows, I’ve participated in galleries, and I have worked with clients of all kinds on commission works. I am passionate about creating things of beauty from thin air — a type of creative magician! Be it sculpture, stained glass, designer jewelry, paintings in every medium, poetry or creative writing, and anything new that comes along; I believe I am called to be true to my gift. In times of plenty and lean, I create, I learn, and I work. And I find my purpose and my joy. 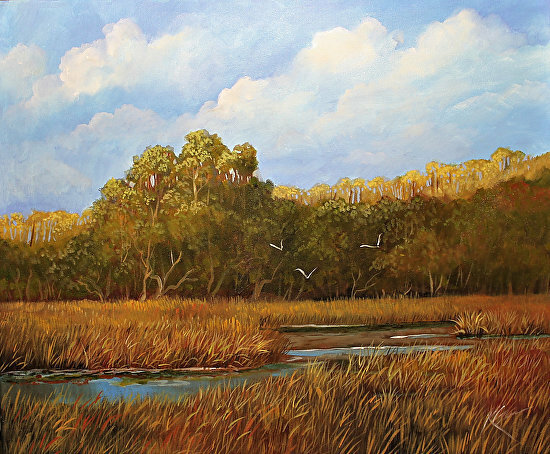 For the past fifteen years, I have created a large body of work showcasing the Charleston low country, scenes of marshes, shrimp boats, and coastal skies. The tidal mud flats, the oyster beds, and backwater creeks fascinated me. They always will, and my heart is always full when I think of the coast. I use my talents to create vistas of all kinds that draw the viewer in and reflect peace and harmony with nature. As a Southern girl, I strayed in the 1990’s to have a secret thing for New England shores, and my heart has been divided ever since. 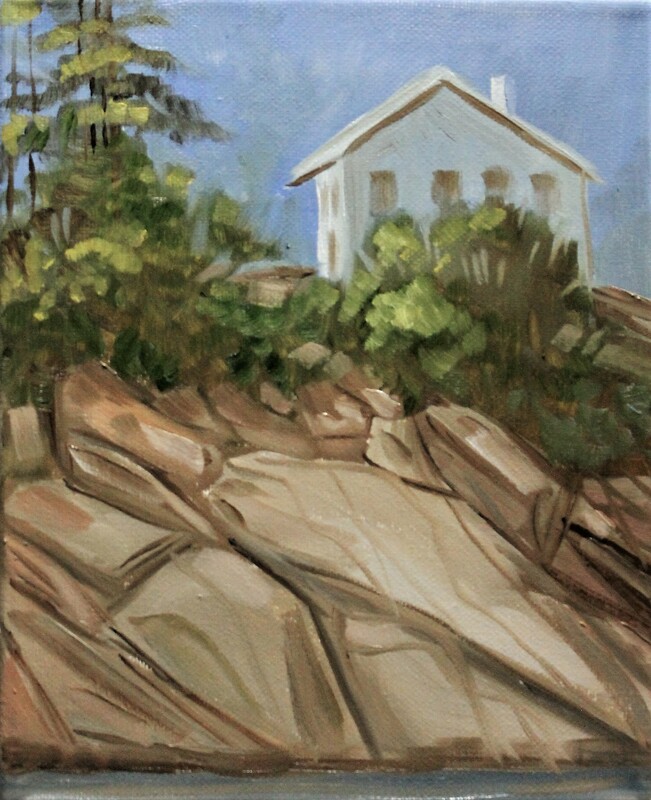 Rocky shores, bright autumn scenes and the land of “lobsta” figure in my new works. I’m also traveling to the desert Southwest to explore the colors and lands of the Navajo, and will soon add that series to my portfolio. I have seen over the years that my collectors crave a sense of peace that they can find when they look at my work. Whether it reminds them of a special place, a time in their life less hectic, or a private memory, they look at the works and say a wistful “ahhh”. The biggest challenge facing artists is how to show at the speed of light. Internet exposure puts art in the hands of potential collectors at a moment’s notice. Keeping the personal aspect that has been so key to commerce in the past is now struggling. The old ideas of making art have a deep and sometimes indecipherable meaning in order to promote its mystique are going by the wayside. Young collectors are savvy, and they are educated or can be in a moment of time. Producing art that is honest, straightforward, and speaking to the spirit of the public goes a long way on the road to success. I also find that a driving work ethic in today’s artists sometimes is lacking, which is disappointing. For generations who have so many creative tools at their fingertips, getting up and getting the art made is romanticized, and “listening to the muse” too often is an excuse. I encourage artists to embrace their craft, create even when they don’t feel like it, but create nonetheless. Get tired and dirty. Do the work. With so many voices crying out for recognition, how else will they be heard? I work with several designers in the Atlanta area and Charlotte, NC area…Avora Daniell Designs in town, and The Lake House in Charlotte/Lake Norman, NC. Katie Walling Designs in Mount Pleasant displays small works in the Charleston area. Wild Hope Gallery in Alpharetta, GA is my local gallery, and I offer private consultations from my Dacula, GA studio. I also maintain an Etsy store – GarnerFineArt, and my artwork is also available from my website, www.karenburnettegarner.com. Of course, most artists will say — buy my work! When they talk of supporting the artist, and I have to agree it is a tangible way to help. Showing my work to the growing public audience is always a blessing, and I am taking more opportunities to exhibit when available. Some artists provoke, some intrigue… I give peace and calm to my viewers, vistas of beauty they sometimes forget to exist. Wonderful artist and a great human being! Loved this article. Thanks so much for featuring one of my absolute favorite local artists!